The world’s largest bottler of Coke shuttered its operations in a town in southwest Mexico on Friday. 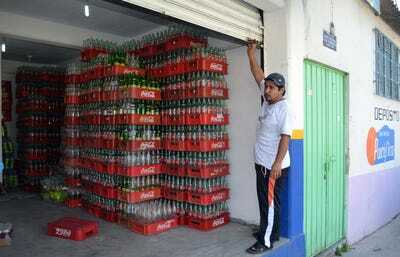 Coca-Cola Femsa said the shutdown was prompted by constant aggression from organised-crime groups. Attacks on big companies and multinationals have been rare in Mexico in the decade since the country ramped up its war on drugs and organised crime. Coca-Cola Femsa, the world’s largest Coke bottler, said on Friday it was indefinitely shutting down operations in Ciudad Altamirano, a town at the northern edge of Mexico’s Guerrero state, because of harassment from organised crime and a lack of response by authorities. Coca-Cola Femsa is a joint venture between Coca-Cola and Fomento Economico Mexicano, which owns 47% of the venture. The firm had been operating in area for 40 years, and with the shut down there it has no other distribution center in the Tierra Caliente region. Since January, Coca-Cola Femsa workers in Altamirano have received “constant threats and aggression” from organised-crime groups, which also affected its facilities, the firm said. Locals said products bottled at the Altamirano plant were being sold at higher prices because of difficulties the company had distributing them. (AP Photo/Alejandrino Gonzalez)An unidentified man stands at a beverage deposit with cases of mostly empty Coke bottles in Chilpancingo, Mexico, February 22, 2015. Guerrero state government spokesman Ricardo Alvarez Heredia said that early Friday morning police stopped an attack on a Coca-Cola Femsa facility in the area, exchanging fire with 20 armed men who tried to force their way into a compound belonging to the company. The attackers fled, but authorities seized a pickup truck, a firearm, and Molotov cocktails, “with which they intended to set fire to the soft-drink facility,” Alvarez Heredia said. One person was arrested. On Wednesday, gunmen opened fire on workers who were reopening the plant’s sales section, which had been closed since January because of extortion threats. One worker was wounded. Alvarez Heredia told Expansion that authorities had meetings with operators from businesses in the area because of insecurity. He said he did not know if the state governor had spoken with businesses from the area, but he said the state and federal government had reinforced security there at the request of businesses. Coca-Cola Femsa has previously encountered similar problems elsewhere in the state. In mid-2015, it suspended operations at its plant in Arcelia because of threats from organised crime. In February that year, the firm halted operations in the state capital, Chilpancingo, for two weeks amid violence in the aftermath of the September 2014 abduction of 43 students from the Ayotzinapa school, most of whom have yet to be found. In August 2014, the firm shut down operations in Arcelia because of harassment from organised-crime groups, mainly cells of La Familia Michoacana, which were attempting to take control of the area. Smaller companies and businesses in Mexico have frequently faced extortion and violence the years since the country’s war on drugs and organised crime ramped up in 2006, but attacks on big companies and multinationals have been rare. Attacks on trucks and warehouses belonging to PepsiCo brand Sabritas in mid-2014 were thought to be the first to directly target a global company. Foreign firms continue to invest in Mexico, though they often favour areas with lower levels of violence. Guerrero is one of Mexico’s poorest and most violent states. The region where Ciudad Altamirano is located, called Tierra Caliente, is especially lawless. The region spreads across Guerrero and neighbouring Michoacan and has become a hub for drug production and trafficking. A number of criminal groups are present there, including elements of La Familia Michoacana and the Knights Templar cartels. There are no local police in the municipalities that make up the region; that role is filled by state authorities and the Mexican military. Statewide, homicides increased 14% between 2016 and 2017. The state’s homicide rate also rose over that period, from 61.67 homicides per 100,000 people in 2016 to 64.26 last year – both among the highest in the country. Guerrero was home to six of the 50 most violent municipalities in Mexico in 2017, including Acapulco, a once idyllic tourist hotspot that was named the third-most violent city in the world last year.